Among the most impressive features of Athanasius Kircher’s Turris Babel were its illustrations, engraved by C. Decker, a German craftsman resident in Amsterdam. The plate of the Tower of Babel itself was based on a drawing by Lievin Cruyl (c.1640–1720), a Flemish artist who worked largely in Rome. The spiral design of the Tower is reminiscent of the archaeological remains of Mesopotamian temple towers, and is taller and thinner than the designs of Matthaeus Merian or of Pieter Bruegel and his imitators. Catalogue no.46, plate between pp.40 and 41. In succession to his reconstruction of the history of the Ark (catalogue no. 37), the Jesuit Athanasius Kircher (1601–80) attempted a similar history of the Tower of Babel. This traced events following the Deluge, as the sons of Noah moved eastwards from Ararat to the plain of Shinar (Genesis 11:2). It described the building of the Tower of Babel, under the tyranny of Nimrod, which had required the work of fifty thousand men, and argued that, despite such effort, it was impossible for this very high building to have reached to the moon, as some had suggested. Using evidence derived from Annius of Viterbo’s spurious amplification of the history of Berossos, Kircher also proposed that Nimrod’s successors as rulers of Babylon had erected a temple in the form of a tower on the ruins of his structure. Following the Jewish historian Josephus, Kircher argued that the original builders of the Tower were seeking protection from future inundations, having recently descended from the safety of the mountains of Ararat to the flat lands of Shinar, and that, as descendants of Ham (the son whose offspring Noah had cursed) they were afraid of attack or of divine punishment. He suggested that God had frustrated this attempt to escape from his power by confusing the speech of the builders of Babel. 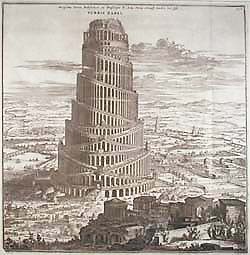 Kircher’s main interest in Turris Babel was with the history of language. He rejected the view that God had made every one of the builders of Babel speak a different language. Instead, the original language, Hebrew, was preserved only in the pure line of Shem and his descendants, and four new tongues began to be spoken by the descendants of the other sons of Noah. The placing of linguistic barriers between families led to the dispersion of peoples, and the settlement of the whole world. In time, the five basic language families themselves split or decayed, leading, Kircher argued, to the existence of seventy-two mother tongues, to which all contemporary languages related. For much of Turris Babel, Kircher concentrates on the history of the Semitic tongues and of writing in the Near East. His discussion of these topics is used as the basis for a Christianized comparative mythology. Here, Kircher built on his earlier work on hieroglyphics, which argued that they were the secret writing of Egyptian priests, and encoded knowledge of the one, true God. Arno Borst, Der Turmbau von Babel, (4 vols. in 6 parts, Stuttgart, 1957–63, reprinted Munich, 1995), vol. 3, part 1, pp.1368–70; Don Cameron Allen, Mysteriously Meant (Baltimore, 1970), pp.119–33.